The Drake Floor Lift™ is a custom hydraulic lift system designed and built into a Drake Truck Body or Trailer. This product is unique in that the lift platform is actually part of the floor. 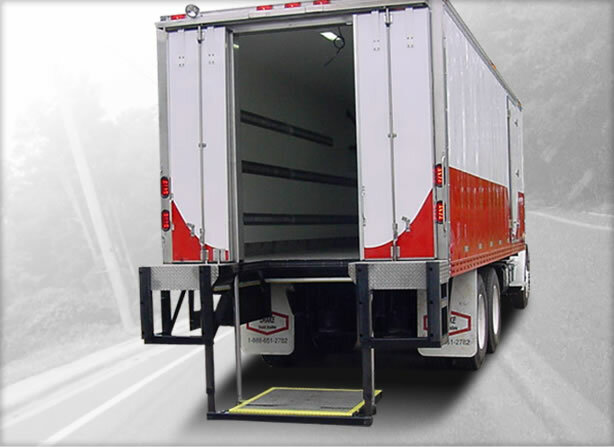 The Drake Floor Lift™ can be located at the rear door or a side door of the truck body. By adding our Drake Floor Lift™ to your Truck Body or Trailer, you can actually save the driver one hour per day in time. It essentially pays for itself within one or two years. The Drake Floor Lift platform is fully enclosed and protected from corrosive road de-icing materials. No moving parts such as bushings or hinges that need to be maintained. The Drake Floor Lift™ is also proven to reduce maintenance cost, workers compensation claims, lost productivity, and frustrated employees by eliminating the need to climb up and down from the truck. It also can eliminate the frustrations of struggling to open and close a traditional heavy lift gate.